Ok – I’m going say something mean. There is no sure thing as the best central air conditioner in the ac market. I disappointed you… did I? HVAC contractors and technicians will agree with me on this. However, it doesn’t mean we couldn’t have the best quality central ac units. There is no existing survey that compares each brand of central air conditioner units. If there were existing survey, I doubt it would be reliable. If one ac company were to make a survey and claim that their central ac units are the best and the rests are not. I’m pretty sure the company would get sue. The only comparison Department of Energy had among central air conditioner unit is Seasonal Energy Efficiency Ratio. Even SEER rating measurements often are not accurate. To have the best central air conditioner system, the parts within the central air conditioner unit have to be high efficient. The condenser coils and evaporator coils has to be clean and efficient. If it not cleans, it will affect the entire ac efficiency. For example, if the central air conditioner unit is 21 seer and the duct work leaks. We might as well have the less efficiency central air conditioner unit in the market. 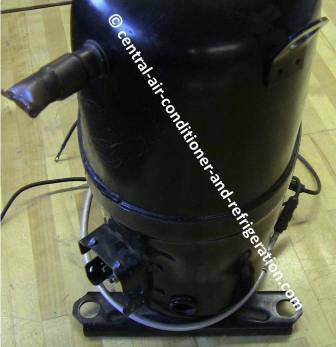 Central air unit is not a single parts, it relies on other parts to operate. If 20 or 30 technicians and contractors were to gather and decide which parts are consider the best for central air conditioner units. This is what I consider they would come up with to have the best central air conditioner units. This is my technical opinion. Some people may not agree to it and that is fine. I will explain why I consider these qualities are the best in central air conditioner units. Between reciprocating (piston) and rotary compressor, I consider Copeland Scroll compressors are durable, energy efficiency and work silent. Air conditioner compressors are not supposed to have a liquid refrigerant entering it. Liquids refrigerant are incompressible and it will damages internal parts of the compressors. Copeland Scrolls compressor can withstands a liquid refrigerant better than any other compressor, because of the dual compliance. The dual compliances are axial compliance and radial compliance. I won’t go into detail. To have the best central air conditioner units we’ll need Copeland scroll compressors. Some technician will not install new central air conditioner units to homeowners without Copeland Scroll compressors. I’m not saying that Copeland Scroll compressor will not break. If technician installs scroll compressor improper it will damage it and like every compressor. There are advanced and disadvantage to every compressor, but Copeland is better. Copeland scroll and Trane scroll compressors are somewhat alike. They both are good. It costs a lot to replace an air conditioner compressor and that why some technician prefers what he thinks is best for his customers. So, he stays with the best parts. I would not buy or install any central air conditioner units without warranty. Why did I consider warranty is the best quality in central air conditioner units? We really don’t know what would happen after installing the central air conditioner units. The ac compressor may malfunction for some unknown reason or other objects may damage the condenser units. This entire scenario could happen. 10 or more years warranty on the central air conditioner parts. Some ac brand offer lifetime warranty on compressor, heat exchanger and 10 years warranty on internal function parts. If someone bought central air conditioner system online the warranty is void. (TXV or TEV) is thermostatic expansion valve. The expansion valve is refrigerant flow control devices. This device is like gates, it decides how much refrigerant could flow throughout the central air units. The reason, I consider TXV as the best quality to have for central air conditioning unit is it abilities to correct refrigerant flow. It is a “self-correct” device. The TXV open it ports or gates depend on how much refrigerant the central air conditioner unit needs. The lower seer ratings and less efficient central air conditioner units have fixed bore, fixed orifice or capillary tube. The capillary tube stays open at the same level regardless how much ac Freon the central air conditioner unit needs. I don’t know of any manufacture still use capillary tube on central air conditioning units. If we’re looking for the best central air conditioner units, it needs TXV. The central ac units with TXV are normally found with higher seer rated and more expensive. Nowadays, every new central air conditioner units should have it, but I don’t know for facts. Ac seer ratings tell consumers how well the central air conditioner unit converts electricity. The central air conditioner unit that uses less energy and product better cooling power are considers energy efficient. As of January 1, 2006, the minimum seer rating central ac unit could install in the United State is 13 SEER. Nowadays, you find central air conditioner units with 23 SEER rating. The higher the seasonal energy efficiency rating the better the central air conditioner units supposed to be. However, sometime Ac SEER rating is not accurate at measuring the energy efficient of the central air conditioner units. I’m pretty sure near future Department of Energy will replaces with better system of measurement to determine the efficiency of central air conditioner units. I really don’t want to include SEER rating. But a lot peoples rely on it. The central air conditioner ducts system are located in attic, crawlspace or in the basement. Duct work is important distribution system that carries the air. To have the best central air conditioner, we need properly insulating and tight ducts system. An air conditioner unit is just a device that removes heat. The duct system makes sure the air conditioner unit absorbs the right heat at the right location and removes those heats and places it to the correct location. If we have the best HVAC and the supply and return duct is leaking air. It defeats the purpose of having high efficient HVAC units. Some many of us focus so much on central air conditioner device and we have forgotten about the duct works. To have higher efficient and best hvac units, we need to check the duct work and make sure it not leaking air from the supply and return lines. Starting on January 1, 2006, the Department of Energy (DOE) requires that new central air conditioner unit installed in United State must meet the minimum 13 seer rated efficiency. Central air conditioner unit with Energy Star symbol meant that the central ac units have met energy efficiency requirement by Energy Star. To qualify for Energy Star symbol, the central air conditioners must be at least 14 SEER. I didn’t want to include Energy Star as the best quality to have in central air conditioner system. But, we look up to it as a comparison. If we want the best central air conditioner units, we need the best HVAC contractor. I realized it weird to include contractor. The person who decides, if we have the highest efficiency central air conditioner unit or the worse central air conditioner unit is the contractor. He either turns 13 seer rating central ac unit to it peaks performance or turn high Energy Star central ac to lowest efficient central ac units. It is important to have best hvac contractor. So, go out and shop for contractor. There are contractor out there, who focus so much on customer satisfaction. And there’re also contractor, who care about the money and not the customers. What the reason of having the best central air conditioner unit went it can’t clean the airborne particles and remove foreign object well? Indoor air tends to be more polluting than outdoor air and on average 90 percent of Americans spend their time indoors. It’s best to have ac filters that remove micro particles. If we need higher efficient filter, we have to decide if the central ac units can withstand the higher efficient filter. Ask the contractor if the central air conditioner unit can withstands it or call our central air manufacture. Planning to buy new central air conditioner? Since, we’re searching for the best central air conditioner units; we’re planning to replace the less efficient air conditioner with a new one. The HVAC contractor is our employee, we decide what types of central air conditioner unit we need and the contractor will buys it for us and install it. The hvac contractor will perform heat lost and heat gain calculation. And from that information he will determine what size of central air conditioner unit is right for our home. Make sure he has the load calculation on papers and explain it to us. That is all I have to said and good luck with search for the best central air conditioner units.